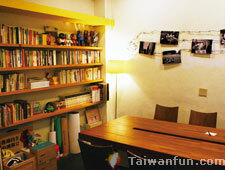 Tucked away on quiet DeHua Street, Find The Way offers a dual experience for visitors. The first floor houses its kitchen, a host of interesting antiques and all manner of information on travel. However, the second floor provides a bright, open seating area with an entire wall dedicated to books. Much like Match Cafe, there is a very studious atmosphere here. You may wander in on a lively group presentation or feel as though you are in a library with everyone quietly absorbed in their reading. Take heed, though, that the resident cat may decide to use your novel as a bed if you leave it unattended for too long. A: The upstairs houses a wide range of reading materials in a well-lit space. B: Whisky the cat waits to greet guests. 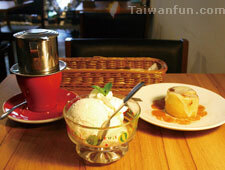 C: Vietnamese Coffee (NT$100), Cinnamon Roll (NT$50) and Vanilla Ice Cream (NT$90). English menu and Wi-Fi available. Alley 3 earns its spot on this list not for being focused on books as such, but for providing two essential reading ingredients--comfort and peace. 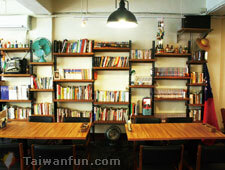 With its location on a secluded alley at the far end of XiTun Road, you would be forgiven for never having heard of it. There is a token supply of reading materials but the main draw is the peace and quiet available here. While it's never deserted, it is also seldom packed to the point where ambient noise prevents you from sinking into a good book. Furthermore, you will often find the place lacking music altogether--an advantage for some who find the constant stream of generic acoustic music in many local cafes to be irritating. Clearly, Alley 3 values its atmosphere almost as much as its meals and drinks. A: The secluded location is a definite selling point. B: The comfortable, homey decor can lead to a lengthy stay here. 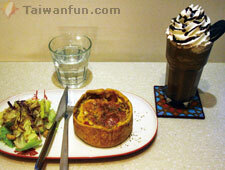 C: Chocolate Oreo Smoothie (NT$160) and Bacon & Tomato Quiche (NT$180). 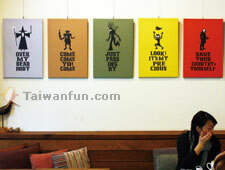 Few cafes in Taichung can lay claim to also being a hub for political activism but Match Cafe is one of them. 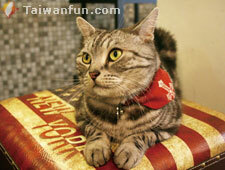 The owner's strong views regarding Taiwanese independence, nuclear power and other issues colour the fabric of this popular spot to a great degree. It's not all politics, though, as Match is also a melting pot for the arts, literature and studying, as its decor attests. On any given day you can view a selection of local artworks displayed on the walls, looking down on the clientele as they pore over their research, plan events and bury themselves in books. A: Politics, literature and art collide in one of the most recent displays, whose panels represent key moments of last year's Sunflower Movement demonstrations. 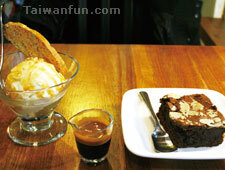 B: Espresso Ice Cream (NT$160) and Chocolate Brownie (NT$70). C: Match provides a range of books about a wide variety of subjects to browse through. 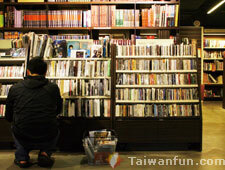 This business, located in a basement near the intersection of GongYi Road and ZhongXing Street, is unnoticed by many passers-by but is a real hidden treasure, as its collection of secondhand books, CDs and DVDs is almost certainly the best in Taichung. The English-language section is good-sized and provides an excellent resource for hungry readers. 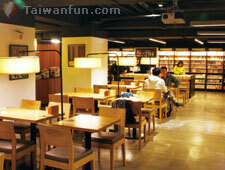 Besides browsing, you can sit down and relax at the cafe here, where signs proclaim, "Free WiFi, free reading!" and a range of snacks, desserts and soft drinks are available for very reasonable prices. 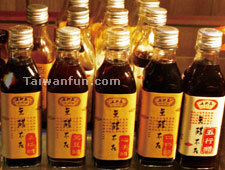 A: Besides the regular menu, bottles of lemon vinegar are available for NT$60 each. B: The eclectic range of media on offer, plus listening stations and TVs for sampling purchases before leaving, can make a visit here a lengthy event. 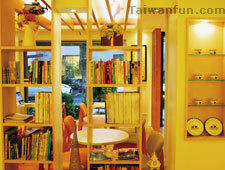 C: The well-lit cafe area provides comfortable seating, perfect for whiling away the hours with a good book.